A European network, established by Council Decision 2008/381/EC, whose aim is to provide up-to-date, objective, reliable and comparable information on migration and asylum to support policymaking in the EU. It also provides the general public with such information. Who is involved in the multi-level EMN network? At EU level, the EMN is coordinated by the European Commission (Directorate General for Home Affairs), assisted by two Service Providers, meeting regularly with National Contact Points (EMN NCPs) appointed in each Member State plus Norway. The EMN is guided by a Steering Board, chaired by the European Commission and consisting of one representative from each Member State plus Observers from the European Parliament and from Norway. Networking and cooperation takes place with other European level institutions and organisations. These include the Commission's Eurostat and Research Directorate Generals, the National Contact Points on Integration, the Fundamental Rights Agency (FRA) and the European Asylum Support Office (EASO). At national level, each EMN NCP develops a network involving partners within their Member State with expertise in migration and asylum from a wide stakeholder group. Please visit the EMN Belgium page for more information about the Belgian NCP. 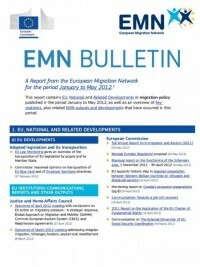 The EMN responds to information needs through Reports, Studies, Ad-Hoc Queries, Policy Briefs (EMN Inform) and Quarterly Reports (EMN Bulletin). It does not normally engage in primary research: instead, its key strength is to collect, document and make available, in an accessible and comparative manner, data and information held or collected at national and EU level. It further analyses and synthesises this information to improve its comparability and harmonisation at EU level. In this way, the EMN makes a valuable contribution to evidence-based policymaking. For additional information and documentation, please visit the EMN Europe website.